When she hit her 40s, Susanne left her corporate career to pursue her passion — skincare. In 2014, Maya Chia was born, its namesake derived from her deep interest in Mayan culture and a star ingredient: chia seeds! I’ve had the pleasure of trying Susanne’s gorgeous line (see my review of her famous serum and a pic of her latest creation) and have been impressed by her thoughtful packaging, formulas and overall process. 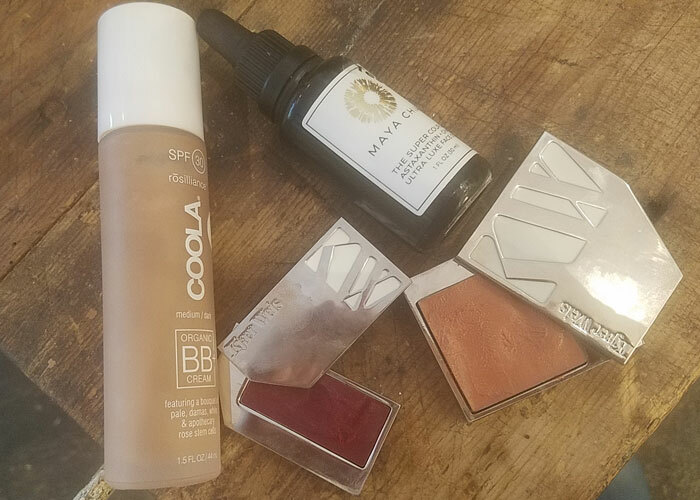 Today, I’m even more excited to share her favorite product picks, which demonstrate a full support of other women entrepreneurs in the green beauty space. It makes me so happy to see women supporting women who are following their natural skincare dreams. We need more of this. This mask is something else. It feels tingly when you first apply it, but it works amazingly well on my skin. Sometimes I love to feel a product actually doing its thing. You shouldn’t always have to feel something tingle on your skin to let you know it’s effective, but with this product, it’s the case, and it’s the real deal. I love a great exfoliator, and this fits the bill and then some. But sometimes I find them to be too harsh, or I don’t find them particularly effective. Not so with this microdermabrasion scrub worthy of the MD name that goes along with it. It’s got the power of what you’d find in a doctor’s office without any of the bad chemicals we don’t want. What’s a good list of must-have products without including a sunscreen? Everyone needs a sunblock, and this brand makes a fantastic one with a rose scent and a tinted moisturizer that gives the skin a wonderful, beautiful glow. It smells beautiful, and I love it. No Oompa-Loompa going on here. Just a lovely glow with a power SPF to boot. I’m quite pale, so when I’m feeling the need to look beachy, I reach for this stuff. Here’s the thing: I’ve been thinking about creating a toner for my line. But I haven’t really felt compelled to do this because I think this one is so beautiful. I love The Jasmine Garden and the way it smells. I think it does a wonderful job of restoring the pH balance to the skin to ready it for products to perform at peak effectiveness. Until I think about how we can improve upon a formula or make something better that doesn’t quite exist just yet, I don’t feel compelled to create. This line is super luxe and the formulas are as beautiful as the packaging. When you put this blush in your hand and feel the weightiness of the packaging, it’s like a little gem. A gem that makes you look awake and beautified. I live in Charleston, South Carolina, so the humidity can make my naturally wavy, curly hair look like a frizz ball. I can literally walk out of the door feeling I have Cher-like silky hair, and then the next minute it looks like a puff of cotton candy. I’ve learned to love the natural waves of my hair and that your hair looks best when you accept its inherent natural texture. Sidebar: Isn’t that a great metaphor for life? In any case, this stuff really helps condition my hair like nobody’s business. I let it sit on my hair while I relax in the tub or shower.